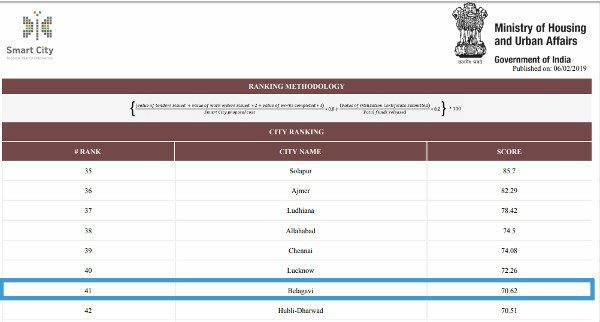 The city falls way behind at the 41st place in the Smart City rankings, released by the Union Ministry for Housing and Urban Affairs on February 6, 2019. Nagpur has bagged the first rank among 100 cities across India for the execution of Smart City projects under various categories. Nagpur, which got a score of 360.21, is followed by Bhopal, which scored 329.32. Belagavi scored 70.62 while the leader Nagpur has scored 360.21. Hubballi-Dharwad is next at 42nd place with a score of 70.51. The ranks are based on the proportion of total smart city projects under progress and completed for a city. The more the proportion of total cost of the project under progress and completed, the higher is the rank. When the peoples start thinking smart then only city will be on 1st rank, Government can only release & realize plans, sustaining is in hands of citizens. Only Amravati is fully utilising smart City benefits!